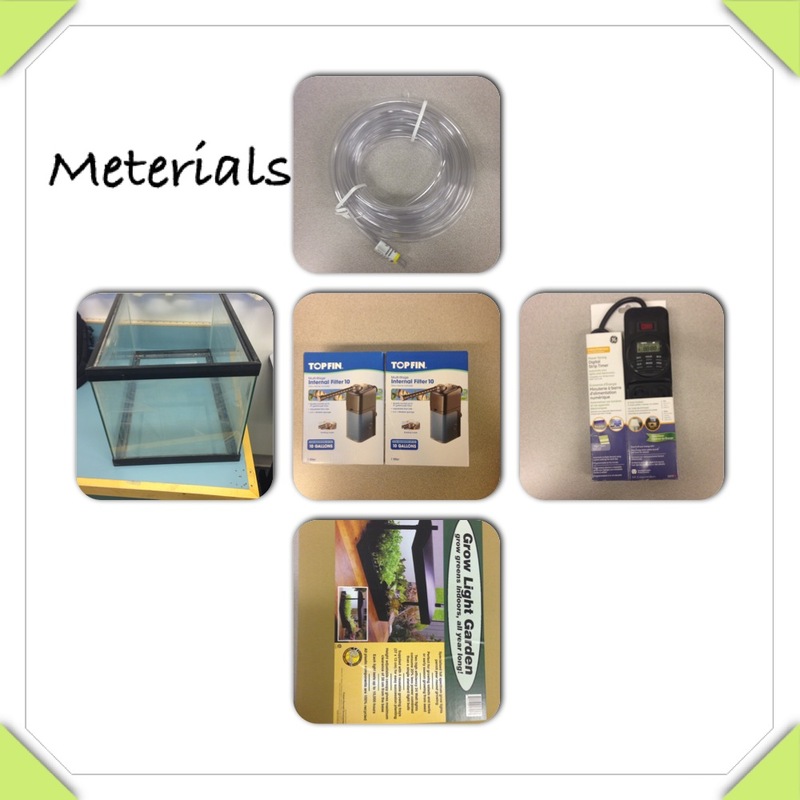 The beginning of our aquaponics project. Today we hooked up both filters and worked on the circulation system. First, we connected the tubing to the filters. Then we filled the fish tank three quarters of the way full, and installed one pump into the fish tank putting the tubing into the grow light. Then we put the other filter on the opposite side of the container with the tubing leading down to the fish tank and let it run. The main idea worked, but still had a few problems. The second container wasn’t filling up enough to pump the water up. We figured out that we need a container that is a little deeper. Today we started another test of our Aquaponics system to see if our circulation system was working well enough to make sure we don’t flood or leak when we get the fish. 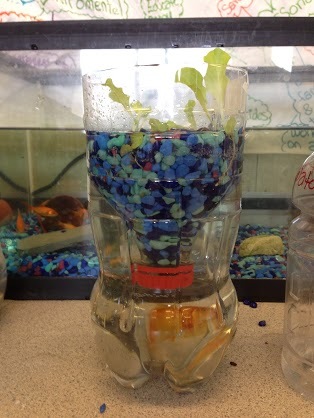 At the beginning our container that the plants will grow in was still above the fish tank on the table, but we realized that that was causing the water to distribute unevenly so the fish tank was getting a lot fuller then the other container. We wanted to see if it worked better if they were on the same level, so we moved the plant container down. Then we started a test to see if the distribution was more even now that we had moved them to an equal level. We marked the temporary container with a green sticky note and set a timer for 30 minutes. During the 30 minutes we kept a close eye on it. At first, the water level went just above the sticky note, but for the next 30 minutes it stayed the same so we know that the water is being distributed fairly evenly now that the containers are level. Today we got a new, larger container with higher walls to maybe grow the plants in. We tested it out with the water system, but it was getting too filled up with water on our first try so it didn’t work out. Then Shauna had the idea of connecting all three containers (the fish tank, grow bed, and new container) so that we have more room to grow plants. We took an extra filter and added on the container to the system. After setting it up and watching it for a while to make sure it wasn’t going to overflow, we set a 30 minute timer to see how it would last over a longer time. We were comfortable with our setup that it would work. Today we ran the water circulation system that we had set up last time.The only change that we made for this test is that we had fish in the fish tank. This afternoon, we observed to see if there was much change in the water levels–there wasn’t. We also watched to see how much the fish would be affected. There was little to no effect on them other than the current in the tank seemed a little different because of where the water was entering and exiting from. 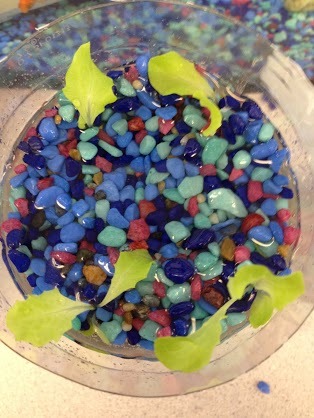 Yesterday we moved our sprouts into the aquaponics system, hoping that they will do well. We left them in the paper towel because the roots were actually threaded through them, and the paper towels would keep them from moving around in their containers. 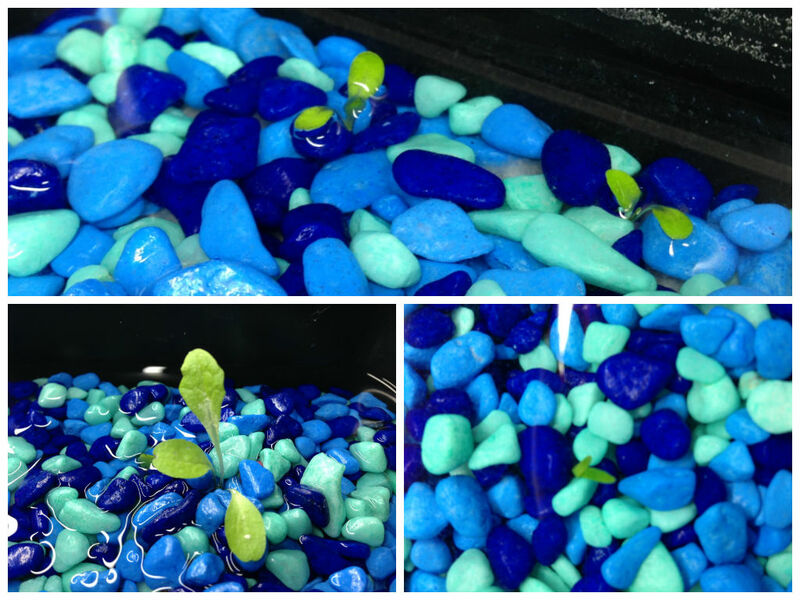 When I walked into the room today, I saw little green sprouts that were moving themselves towards the light. My only worry is the 8 small feeder fish may not give the amount of nutrients the plants will need as they grow so we may and probably will need to get more fish. For today we will run the system to give them fresh new nutrients. All of the trays either have sprouts or small plants growing in them. One tray has a much bigger plant then the rest and I believe that this is because it was closer to where the fish water was entering our tray. We shuffled the tray around so that all the plants get as much nutrients as possible. So far it seems to be doing good, although we have not let it run overnight yet due to the chance of it overflowing. Everyday we hook it up and let it circulate for the day until we work through all of the kinks. We are also going to look into lowering the light so that the plants don’t grow too tall and flimsy. 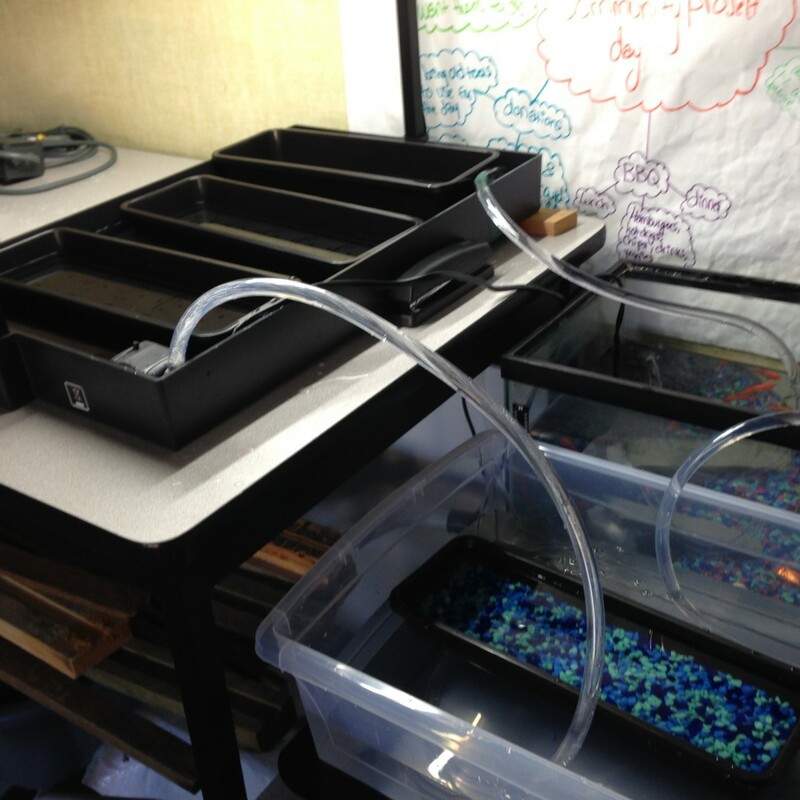 This week we started to put together a new aquaponics system. 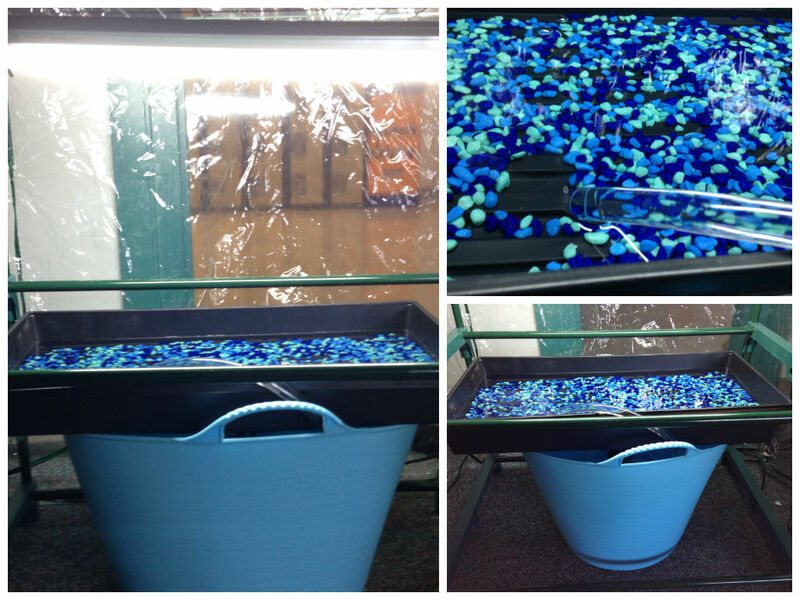 We took a large flexible bucket (where the fish would be), filled it up with water, and put two trays (one inside of the other) on top where the plants would grow. One tray has holes all over the bottom which drains the water into the tray below it, which only has holes in the middle to drain into the bucket. There is a pump and tube coming out of the bucket and into the tray, bringing water up. The water drips through the holes and back into the bucket. We like this system better than the first one, because it is much simpler and takes up less space. It has been pointed out to us though, that it may not be leak proof but for now we will let it run and see how it does. We are also designing and drawing out more plans to make it even better. 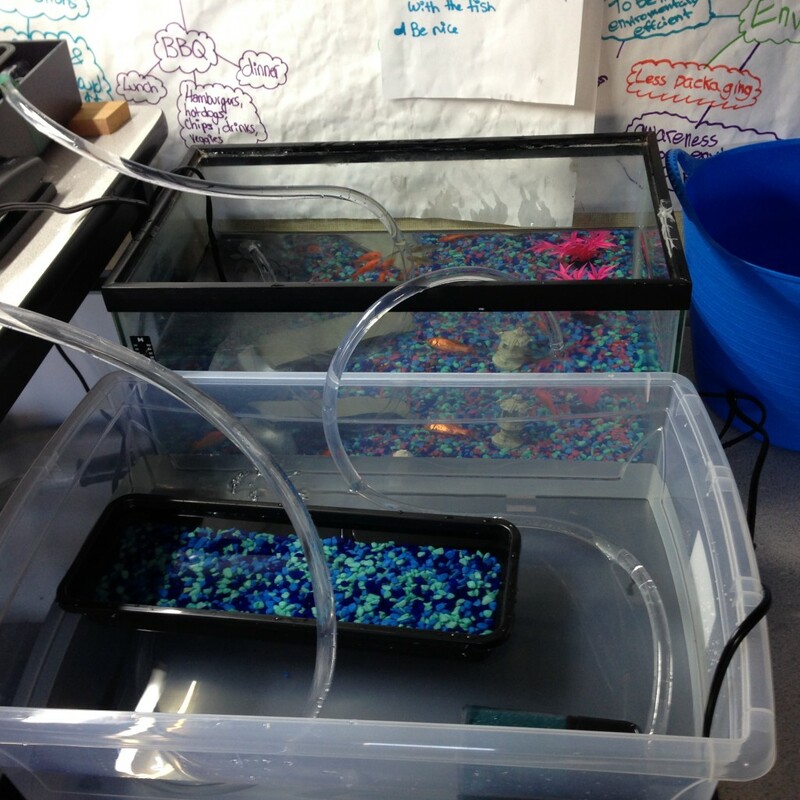 Before winter break we realized that we needed to construct a more portable aquaponics system. I took the system home, and it was working pretty well for the first week or so, but after that all the plants died. We think that this is because A) we only have 5 fish (the others have all died–we need to get more) and B) we cut too many holes in the second tray, so water was dripping out of the trays holding the lettuce faster than it was being brought up, which meant that the plants weren’t getting enough water or nutrients. We are going to buy some more fish, and also remake the system so that it works better. We have just realized that we left the spongy filter part inside the pump–it was filtering all the fish nutrients out! This is good news because it means that there wasn’t a problem with the system, just the way we set it up. Yesterday, we made new aquaponics systems out of empty pop bottles. We are just trying them out, but so far they seem to be working well. 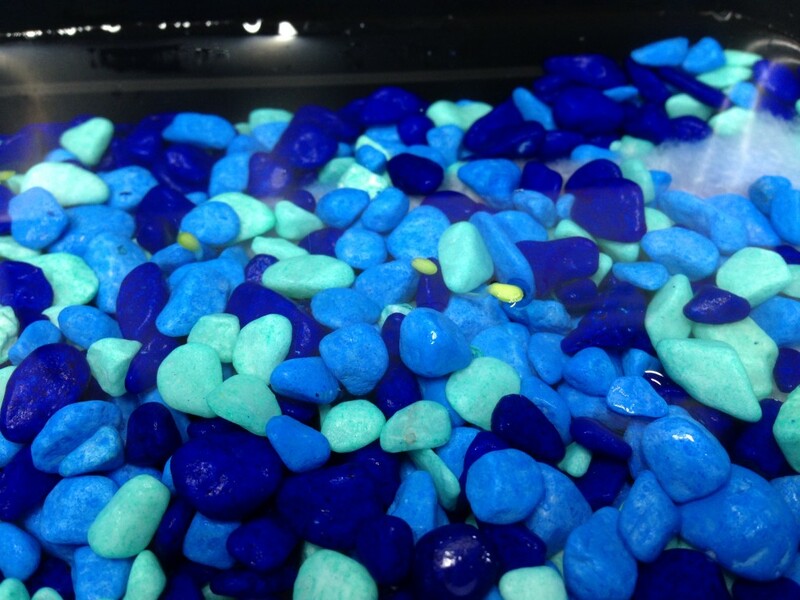 After our first attempt, the fish died, so now we are trying to work to make a better environment for the fish. This is where we got busy with outdoor gardening work and put a pause on our aquaponics project. We hope to continue working on it.